I’m Just Not That Into Birthday Parties…Judge Away - What Doing Mommy? It’s Birthday Season AND I’m NOT hosting a single party!!! Woot Woot! Okay, it’s probably not birthday season for you, but for me when April rolls around I know that it’s time to start prepping for birthday celebrations. My kids celebrate their birthdays only 36 days apart from one another. As if that weren’t enough, they are both right before major holidays; one is two days before Memorial Day and the other is two days before Independence Day. My Type-A game has to be all the way turned up to pull it off. Thankfully, hubby and I have always agreed that we would only “celebrate” major milestone birthdays. What’s that? Well, essentially, we have chosen the years that we will do big celebrations. In between, we keep it small and simple. For us, that means we do it BIG (big is relative) for the 1st, 5th, 10th, 13th and 16th birthday. Now don’t get all sad for our kids and think we don’t acknowledge the off years. We definitely do! But those are small family celebrations, perhaps just for the 4 of us, or we take cupcakes to the classroom or go out to dinner and invite 1 friend. Simple, small, no major pre-planning or clean up necessary for me! PERFECT! This year is an off-year. Woohoo! The kids are turning 6 and 3. Both will get cupcakes in the classroom with the theme of their choice. And of course, I will make a birthday cake for each of them for our “at-home” celebration, which has become quite the tradition. 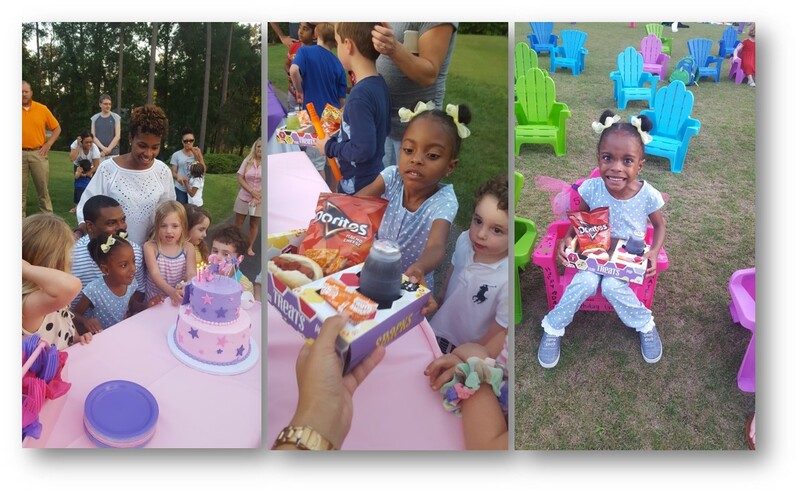 I figured since I have more “free time” this birthday season I would take a moment to recap Katelyn’s 5th Birthday celebration. I hope, that for those of you who are planning an upcoming party, that this post may spark some inspiration or provide a few helpful tips as you embark on the journey to make your kids smile. As an added bonus, I provide an awesome discount from one of my favorite vendors for all you faithful followers! You can’t choose a date too early or too late for birthday celebrations in my opinion. Greater than a week before or after just feels different. Since Katelyn’s birthday is at the end of the school year and right before Memorial Day, choosing a date can be tricky. You run the risk of interfering with people’s holiday travel or BBQ plans. We settled on the 21st before the holiday and the day after the last day of school thinking that people would still be around to help us celebrate. This is the fun part! Once you pick a theme its soo much easier to figure everything else out. I knew I wanted something age appropriate and fun! Katelyn had also informed me that she needed the colors to be purple and pink because those were her favorite (at the time). I scrolled through Pinterest for ideas. I saw a lot of sleepover parties suggested but I was not ready for that but it did lead me down the path to our eventual theme. A movie night…but with a twist. We would have it outside with a huge inflatable movie screen. Since school was out, I figured parents wouldn’t mind their kiddos staying up past bedtime. Most everything I saw with a movie theme was with red and yellow (not the suggested favorite colors) as the primary colors with lots of stars and red carpets. Real Hollywood movie premiere type themes. But then I came across a pajama party invite that depicted night time under the stars and it all came together. It would be Katelyn’s Movie Night Under the Stars! PERFECTO!!! **Selecting an age appropriate movie was very important. Too often the “kids” movies contain inappropriate content. I also let parents know the movie title in advance. But its May…which means unpredictable rain, right? Could we really pull this off? We would need a venue that could offer an indoor option just in case we were blessed with rain. I visited at least 5 different places; that didn’t feel right. Considered and quickly dismissed our backyard, as we had just moved into our house and I was not ready for the traffic or little people hands on everything. I then stumbled upon the Golf Clubhouse for the subdivision that neighbors our community. It didn’t have a backyard but it had a front lawn that was flat AND perfectly manicured because it was a part of the golf course. Once I discovered that we could move our party inside, if necessary, I knew I had to book it. They had never hosted a movie on their front lawn but were excited about the opportunity. The clubhouse had a full kitchen as well since it was the restaurant for the golfers but they agreed to allow us to bring in our own food. Cha-Ching (as in major SAVINGS)! Icing on the cake was the full service bar that would be open during our event to the public which meant parents could relax and enjoy a few spirits if they wanted. This would be the first celebration where we invited ALL the classmates. For us, that meant 32 little people, potentially their siblings and their parents. See how fast that guest list grew in a mere 5 seconds? That is the problem with kid birthday parties folks. If you’ve ever thrown one you know that 1. The kids talk and share birthday news 2. If you send invites to the class, everyone must receive one 3. Your child’s best friend will most likely be in another class which could potentially mean inviting those students as well and 4. go ahead and accept that most parents will bring siblings. No one is paying a babysitter for their kid to attend your child’s party. You will then have the task of deciding where to draw the line. Do you include friends from the neighborhood? What about all the friends from dance, gymnastics, etc. The guest list in and of itself is enough of a reminder for me as to why we only do milestone birthdays. It can get OUT OF CONTROL real quick. An outdoor movie party really leaves the options wide open for décor and food. You can go all out with movie themed items and accessories or keep it simple with blankets on the lawn and popcorn. You can get just about any food at a theater now-a-days. I went middle of the road. I decided to get the cutest kiddie Adirondack chairs in colors that complimented the pink and purple. Walmart, Dollar General and ToysRUs put these out every year around April/May. I personalized Katelyn’s chair to make it stand out from the others. I had a custom “movie poster” made with Katelyn as the star. And we had tee lights in white paperbags to frame the perimeter of the lawn and provide some light after sunset. For food, I went with hotdogs (easy to keep warm), assorted chips and juice boxes. We scored the cutest kid movie trays for the littles to put everything in and easily carry to their seat. Of course, we rented a popcorn machine. A movie night without one would have been a travesty. We also had a small sweet treats section with skittles, starburst, jelly beans and chocolate chex mix. The cake was a chocolate in pink and purple with stars cascading down the front. We had 3 tables set up and the linen for those were in the pink and purple as well. Other than that, we had a few balloons and a theater sign but not much else was required. 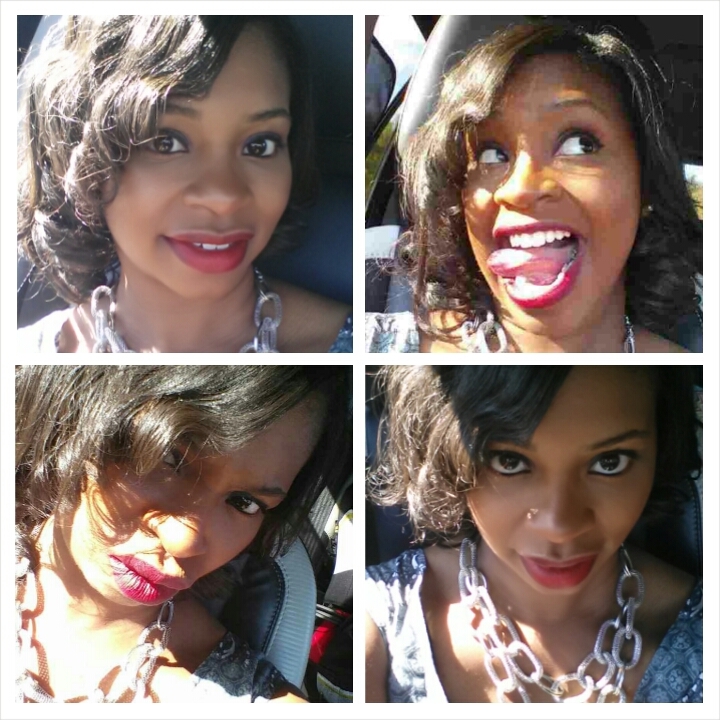 Once I had the theme and venue, I started thinking about invitations. I knew I wanted more than an Evite or a Fill-in-the-Blank invitation since we were going BIG. I turned to one of my favorite stationers Derica Justice of Bon Bini Print & Design. I love her work! We have used Bon Bini for a number of our celebrations. She offers cute custom invitations at affordable prices. Most importantly, customer service is AMAZING and she is easy to collaborate with if you have design ideas that you just need a little bit of help bringing to life. I sent Derica the pajama party invitation as well as a few other samples that reflected the style I liked. I also sent her a picture of our would-be cake. In maybe 2 days she sent me a mock-up to review and make changes. As you can see, it was beautiful and perfectly captured the theme and vibe we were going for with the party. She even created a movie ticket as an insert. **Psst…there is an awesome Bon Bini discount for readers at the end of this post. Keep reading. ** You can’t show a movie outside until sunset so we started the party at 7:30P. That gave us time for the kids to run around and play and for us to sing happy birthday and cut the cake. 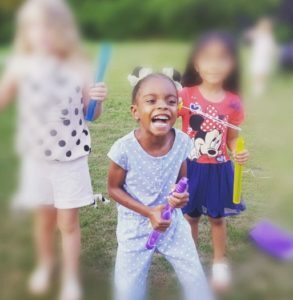 We purchased a few of those 4 pack long bubble wands from Walmart that were a hit with all the kiddos. That went home (if any bubbles were left) inside a plastic popcorn box purchased from the Targets $1 bin, some “star” sunglasses (Party City) and a treat bag they could fill with items from the sweet treats table. At sunset we handed out glow necklaces. I was going to call this section Day-of-Woes but I really didn’t have many. I was initially concerned about the weather. It rained earlier in the week but ended up being beautiful the day of the party. I did remember to call the event manager at the clubhouse to ensure that they turned off the sprinklers that morning. I had 4 adults helping me with setup so it did not take nearly as long as I imagined. I did not receive an RSVP from everyone (surprise) so hoped that I had enough of everything. We had at least 5 extra people. I ended up with more chairs than necessary; which I did return. Saving receipts is key! I also didn’t realize until the day of that I bought the larger sized chips (you know the kind that come in the variety pack) instead of the smaller bags I intended. I hate wasting food. But I had to roll with it. I hadn’t thought about music but the company that set up our inflatable movie screen had the ability to blue tooth connect to our phones, so hubby used Pandora and turned to Kids Bop. That made the time before the movie started quite fun. The kids blew bubbles, danced and laughed and ran and ran some more. Parents were able to sit back and just relax because the area was self-contained. In my VERY biased opinion it was truly an EPIC birthday celebration. We captured that beautiful smile we wanted from Katelyn and solidified memories for a lifetime! Good luck to those of you planning celebrations this year! If you’re in need of invitations don’t forget to check out Bon Bini Print & Design. She ships nationwide. My readers will receive 15% off all custom orders through June 30th, 2017. Use coupon code WHATDOINGMOMMY at checkout. I’d love to hear if any of you do milestone celebrations or have considered it? If you have questions about any of the items in the pictures above, leave me a comment or shoot me an email. Thanks for reading! That birthday party idea was so original and it sounds like it was a big hit with the kids. Great job LaToya! Crystal they really did have a great time! Thank you for stopping by and taking the time to comment! Thanks for stopping by Syl! This was truly an epic party! Great job! Thank you! We appreciated you all traveling and helping us to celebrate!